Another Islamist terror attack, another round of assurances that it had nothing to do with the religion of peace. I've seen this before. A Muslim terrorist slays a non-Muslim citizen in the West, and representatives of the Muslim community rush to dissociate themselves and their faith from the horror. After British soldier Lee Rigby was hacked to death last week in Woolwich in south London, Julie Siddiqi, representing the Islamic Society of Britain, quickly stepped before the microphones to attest that all good Muslims were "sickened" by the attack, "just like everyone else." This happens every time. Muslim men wearing suits and ties, or women wearing stylish headscarves, are sent out to reassure the world that these attacks have no place in real Islam, that they are aberrations and corruptions of the true faith. But then what to make of Omar Bakri? He too claims to speak for the true faith, though he was unavailable for cameras in England last week because the Islamist group he founded, Al-Muhajiroun, was banned in Britain in 2010. Instead, he talked to the media from Tripoli in northern Lebanon, where he now lives. Michael Adebolajo—the accused Woolwich killer who was seen on a video at the scene of the murder, talking to the camera while displaying his bloody hands and a meat cleaver—was Bakri's student a decade ago, before his group was banned. "A quiet man, very shy, asking lots of questions about Islam," Bakri recalled last week. The teacher was impressed to see in the grisly video how far his shy disciple had come, "standing firm, courageous, brave. Not running away." Bakri also told the press: "The Prophet said an infidel and his killer will not meet in Hell. That's a beautiful saying. May God reward [Adebolajo] for his actions . . . I don't see it as a crime as far as Islam is concerned." The question requiring an answer at this moment in history is clear: Which group of leaders really speaks for Islam? The officially approved spokesmen for the "Muslim community"? Or the manic street preachers of political Islam, who indoctrinate, encourage and train the killers—and then bless their bloodshed? 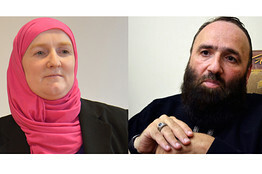 Julie Siddiqi, executive director of the Islamic Society of Britain; Omar Bakri, a radical Muslim cleric barred from Britain. In America, too, the question is pressing. Who speaks for Islam? The Council on American-Islamic Relations, America's largest Muslim civil-liberties advocacy organization? Or one of the many Web-based jihadists who have stepped in to take the place of the late Anwar al-Awlaki, the American-born al Qaeda recruiter? Some refuse even to admit that this is the question on everyone's mind. Amazingly, given the litany of Islamist attacks—from the 9/11 nightmare in America and the London bombings of July 7, 2005, to the slayings at Fort Hood in Texas in 2009, at the Boston Marathon last month and now Woolwich—some continue to deny any link between Islam and terrorism. This week, BBC political editor Nick Robinson had to apologize for saying on the air, as the news in Woolwich broke, that the men who murdered Lee Rigby were "of Muslim appearance." Memo to the BBC: The killers were shouting "Allahu akbar" as they struck. Yet when complaints rained down on the BBC about Mr. Robinson's word choice, he felt obliged to atone. One can only wonder at people who can be so exquisitely sensitive in protecting Islam's reputation yet so utterly desensitized to a hideous murder explicitly committed in the name of Islam. In the wake of the Boston Marathon bombing and the Woolwich murder, it was good to hear expressions of horror and sympathy from Islamic spokesmen, but something more is desperately required: genuine recognition of the problem with Islam. Muslim leaders should ask themselves what exactly their relationship is to a political movement that encourages young men to kill and maim on religious grounds. Think of the Tsarnaev brothers and the way they justified the mayhem they caused in Boston. Ponder carefully the words last week of Michael Adebolajo, his hands splashed with blood: "We swear by almighty Allah we will never stop fighting you. The only reason we have done this is because Muslims are dying every day." My friend, the Dutch filmmaker Theo van Gogh, was murdered in 2004 for having been insufficiently reverent toward Islam. In the courtroom, the killer looked at Theo's mother and said to her: "I must confess honestly that I do not empathize with you. I do not feel your pain. . . . I cannot empathize with you because you are an unbeliever." And yet, after nearly a decade of similar rhetoric from Islamists around the world, last week the Guardian newspaper could still run a headline quoting a Muslim Londoner: "These poor idiots have nothing to do with Islam." Really? Nothing? Of course, the overwhelming majority of Muslims are not terrorists or sympathetic to terrorists. Equating all Muslims with terrorism is stupid and wrong. But acknowledging that there is a link between Islam and terror is appropriate and necessary. On both sides of the Atlantic, politicians, academics and the media have shown incredible patience as the drumbeat of Islamist terror attacks continues. When President Obama gave his first statement about the Boston bombings, he didn't mention Islam at all. This week, Prime Minister David Cameron and London Mayor Boris Johnson have repeated the reassuring statements of the Muslim leaders to the effect that Lee Rigby's murder has nothing to do with Islam. But many ordinary people hear such statements and scratch their heads in bewilderment. A murderer kills a young father while yelling "Allahu akbar" and it's got nothing to do with Islam? I don't blame Western leaders. They are doing their best to keep the lid on what could become a meltdown of trust between majority populations and Muslim minority communities. But I do blame Muslim leaders. It is time they came up with more credible talking points. Their communities have a serious problem. Young people, some of whom are not born into the faith, are being fired up by preachers using basic Islamic scripture and mobilized to wage jihad by radical imams who represent themselves as legitimate Muslim clergymen. I wonder what would happen if Muslim leaders like Julie Siddiqi started a public and persistent campaign to discredit these Islamist advocates of mayhem and murder. Not just uttering the usual laments after another horrifying attack, but making a constant, high-profile effort to show the world that the preachers of hate are illegitimate. After the next zealot has killed the next victim of political Islam, claims about the "religion of peace" would ring truer. Ms. Hirsi Ali is the author of "Nomad: My Journey from Islam to America" (Free Press, 2010). She is a fellow at the Belfer Center of Harvard's Kennedy School and a visiting fellow at the American Enterprise Institute.